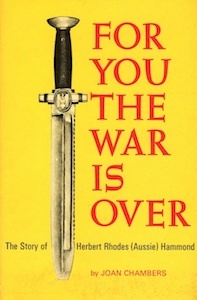 “Herbert Rhodes (Aussie) Hammond, was born in Salisbury, Rhodesia, of South African parents. At an early age he went to live in Australia. He returned to South Africa in 1938 and joined the South African Forces as a Volunteer at the outbreak of the 1939-45 World War II. He was a member of the 1st Brigade Signal Corps and at the time of the battle of Sidi Rezegh was a sergeant in the South African Corps of Signals (S.A.C.S.). "Aussie" Hammond was a man of strong character and was held in very high esteem by all his fellow men. Hammond was taken prisoner at Sidi Rezegh in 1941, but overcame the humiliation of captivity to the extent that he earned the ready respect of his captors. Prisoner he might be, but Hammond never ceased to be a soldier and born leader; nor, necessarily, was for Hammond the war over. He rendered sterling service to his fellow P.O.W's as a voluntary Camp Leader and was a tower of strength to them. A strong disciplinarian, he maintained the moral of his comrades by his fearlessness in defending their rights against unpopular actions by the enemy guards and for his services, especially as a Camp Leader, he received a personal letter of thanks from the late General Sir Pierre van Ryneveld, Chief of the South African General Staff, at the cessation of hostilities in 1945.